We’d love your help. 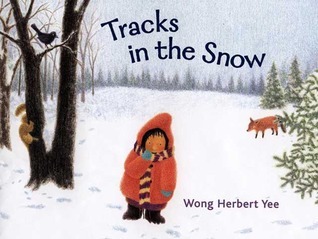 Let us know what’s wrong with this preview of Tracks in the Snow by Wong Herbert Yee. There's a mysterious set of tracks through the snow, but who do they belong to-a rabbit, a duck, a woodchuck? On this brisk day one little girl is determined to find out. So off through the woods she tramps in hopeful discovery. Where will the tracks lead her and what might she find? Come join in th Tracks in the snow. There's a mysterious set of tracks through the snow, but who do they belong to-a rabbit, a duck, a woodchuck? On this brisk day one little girl is determined to find out. So off through the woods she tramps in hopeful discovery. Where will the tracks lead her and what might she find? Come join in the search! To ask other readers questions about Tracks in the Snow, please sign up. when will this title / author be available via UK bookshops?! Tiny little book with illustrations that look like they were made with crayon. The textures are nice, as if everything has a fuzzy finish. The story has a simple rhyme that doesn't always work. I kind of hate myself for giggling at the phrase "tramp-stamp. u At the end, I couldn't tell if the little girl was imaginative or just stupid, but she was definitely cute. A little girl wakes up to find tracks in the snow. She is curious and wants to find out who they belong to. The book follows her on her adventure to find "who made these tracks? Where do they go?" This is a multicultural book because it is about a person of color. 1-Voice- This is written in 1st person. 2-Sentence Fluency- The repetitive words in this story help it flow. 3- Organization- The reader wonders with every turn of the page if the child will find out who make these Tracks A little girl wakes up to find tracks in the snow. She is curious and wants to find out who they belong to. The book follows her on her adventure to find "who made these tracks? Where do they go?" 3- Organization- The reader wonders with every turn of the page if the child will find out who make these Tracks in the Snow. 1- This book is a good example for students how to write in the 1st person. Easy for even a younger child to read and then emulate in their own writing. 2- This book teaches students that using repeated words can help their writing flow. What I really like about this story is young children can read it and very soon recite the repeating words. My daughter loved books like this. It could be used in a kindergarten classroom. The teacher could read it to the students and they could join in for "tracks in the snow, tracks in the snow. Who made theses tracks? Where do they go?" 3- This book could be used to teach young writers how to keep their readers engaged by adding suspense to their writing. 4- It is also a short but sweet book and young readers love being able to easily read an entire book by them selves. A sweet little winter story. Super cute book with clues throughout to help you guess who made the tracks in the snow. The illustrations are lovely, and I like the simple story line. But there were too many lines that didn’t quite scan for my taste. Cute book about a little Asian American girl playing in the snow. The illustrations were very soft and fuzzy. This story is about a little girl who looks out the window and see tracks in the snow. She bundles up and heads out to find out "who made the tracks?" and "where do they go?". This book has beautiful illustrations of the little girl enjoying the snowy woodlands around her house. The pictures give a great opportunity to ask your child questions about what they see as there are different animals scampering around through out the story. The text includes lots of rhyme and repitition. Its an excellent This story is about a little girl who looks out the window and see tracks in the snow. She bundles up and heads out to find out "who made the tracks?" and "where do they go?". 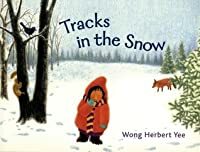 This book goes on a journey with a little girl who follows some tracks in the snow and she is exploring to see who has made them and where they lead to. This is a good book to follow up with a lesson about discover and exploration. You can also talk about winter and the types of animals that are around during this time. This rhythmic book is sure to be a story time favorite with the kindergarten and younger set. The soft, whimsical illustrations, simple rhythmic text and hint of mystery as a little girl follows some tracks in the snow trying to figure out who made them will delight audiences. Great piece for snowy day reading or to introduce animals in winter or the concept of tracking. A girl follows tracks in the snow to discover who they belong to, finding that they are her own tracks left the day before. The book is too small to use in storytime, but would be good for one on one sharing, or for an early reader. A good choice for a winter read. There isn't an obvious lesson taught, but a discussion about discovery/ exploring could be enhanced with this story. Would be acceptable to read to children even in the upper elementary grades. SPOILER: Cute story about girl following footprints to find out who they belong to only to discover they are hers from the day before. Nice cozy little story; child wonders who made the tracks in the snow. Small format, best one on one. A circular mystery story concerning tracks left in the snow. We love this book! It's small and perfect for little people. The illustrations are beautiful and really pull you into the story. Very cute, short, simple winter story for preschoolers. An exploration after a snowstorm with a hint of mystery. Loved the feeling of being outside in the snow along with this child who can't figure out where the tracks she was following came from. All of the snow reminds me of Iowa! A nice short book about winter time, repetitive phrase and soft illustrations. Perfect for a winter story time. Reading & Writing Workshop - Leaving Tracks in the Snow, writing notes, highlighting, and underlining as we read. Shows metacognition. Who left tracks in the snow? There's only one way to find out! Follow them and see where they lead.